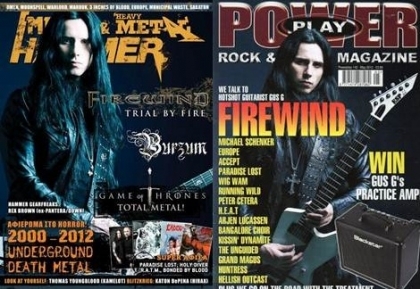 FIREWIND - Debut "Losing My Mind" song online; video for 'Wall Of Sound', UK tour, Cover features! FIREWIND’s newest album, “Few Against many”, was mixed by Jason Suecof & Eyal Levi at Audiohammer Studios (Trivium, All That Remains, Death Angel, etc.) and mastered by Alan Douches at West West Side Music (Mastodon, Hatebreed, Symphony X, etc.). The iconic album’s artwork was once again created by FIREWIND’s longtime partner in all design matters, Gustavo Sazes / www.abstrata.net (Arch Enemy, Angra, Dream Evil, etc. ), who has been working with the band since the release of the album “The Premonition”.